Try some of these simple DIY solutions to eradicate this common lawn invader. Stubborn weeds are the bane of a beautiful lawn. Yet, although it’s pretty stubborn, clover (aka Trifolium repens) is actually beneficial. It brings nitrogen into the soil and encourages grass growth when it decomposes. In fact, some grass blends even include micro-clover as a welcome addition to a lawn. Still, many homeowners simply don’t appreciate all those small white flowers interrupting their field of green. Mowing it over is only a temporary fix, as clover always grows back, and fast. So if you’re adamant about keeping this herbaceous three-leaved intruder off your landscape, you’re in luck! Read on for easy remedies that can get rid of clover for good. Knock it out with nitrogen. Generally speaking, a well-fertilized lawn keeps all weeds at bay, but ensuring proper nitrogen levels will give you an extra edge against clover. It’s a lack of nitrogen that allows clover to thrive, so try a nitrogen-rich weed-and-feed formula. Organic fertilizers might do the trick if you have a small amount of clover, but if your lawn is becoming overrun, choose a standard fertilizer that is not slow release. Remove it manually. Don’t give clover a chance to spread. 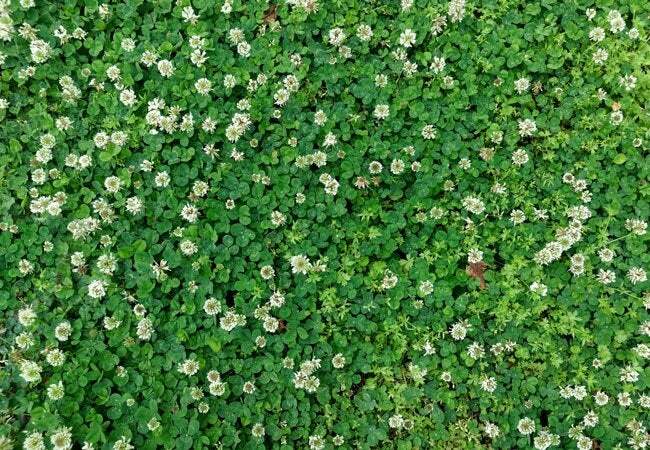 Get rid of small clumps as soon as you notice them by gently loosening the soil around the base with a spade or your fingers, then plucking the clover up. Be sure you get all of the root. Cook it. 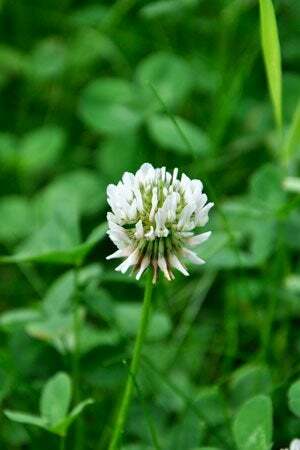 A natural way to thwart clover is to deprive it of sunlight and oxygen. Place plastic sheeting (a garbage bag will do) on top of clover, securing the corners so it won’t blow away. This ought to kill the weed in a few weeks, but use this method only on large clover patches; otherwise, surrounding grass will probably experience collateral damage. Douse it. Here’s a natural remedy many gardeners find effective: Mix vinegar with a small amount of dish soap, put the mixture in a spray bottle, and spot treat clover clumps. Just take care to avoid surrounding plants. Kill it with corn gluten. Available for purchase online and at your local garden center, corn meal gluten can inhibit clover growth without causing ill effects to nearby plants. It releases organic dipeptides into the soil, which dry out seeds and make it more difficult for them to sprout. Spread about 20 pounds of corn gluten meal per 1,000 square feet of lawn, water well, and allow to dry naturally. Hit back with herbicide. If you’ve got to pull out the big guns to get rid of clover, broadleaf herbicides can do the job. These products generally contain the chemicals Dichlorophenoxyacetic acid, Mecoprop, and Dicamba, which disrupt normal growth patterns and cause the weeds to twist, the leaves to cup, and the stems to crack. While these herbicides don’t harm surrounding grass, they can hurt some garden plants and insects, so it’s wise to spot treat directly on clover rather than apply freely.